This article is by guest writer, Brooke, from Happy Simple Mom. It all started with an experiment one week on school break. I wanted to add purpose and intentionality to the end of their break. I wanted it to be memorable, my first year home not working. My entire purpose for the year was “simplify and be more intentional”. 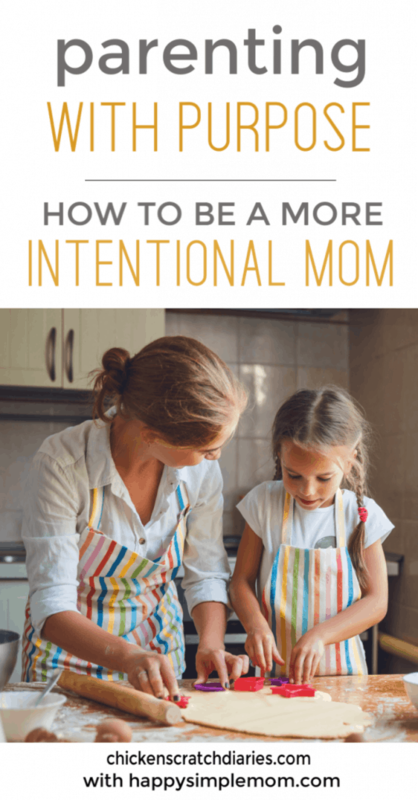 One of the ways I wanted to do this as a mom was to implement more intentional parenting. My first and primary goal was to make more time to connect with my kids. You see, I quit my job in the corporate world and we moved to a rural mountain town. I went from working fifty hours a week to being home an entire summer with my children in a wonderful, new place. Yet, as the summer days passed, we fell into a wonderful mundanity that was nice and relaxing but lacking the level of intentional parenting I was hoping for my first summer home with the kids. I’m no certified expert. Rather, I’m a mom trying to do my best each and every day, growing strong, confident children with caring and loving hearts. I want them to have a strong connection and positive influence with their family and those around them. I want them to make an impact on the world. For me, intentional parenting means practicing parenthood with thoughtfulness, morality, and intention. It means teaching my children to be respectful, to do what is right, and to find ways to connect with other people. One way I want to be an intentional parent is to be a present parent. 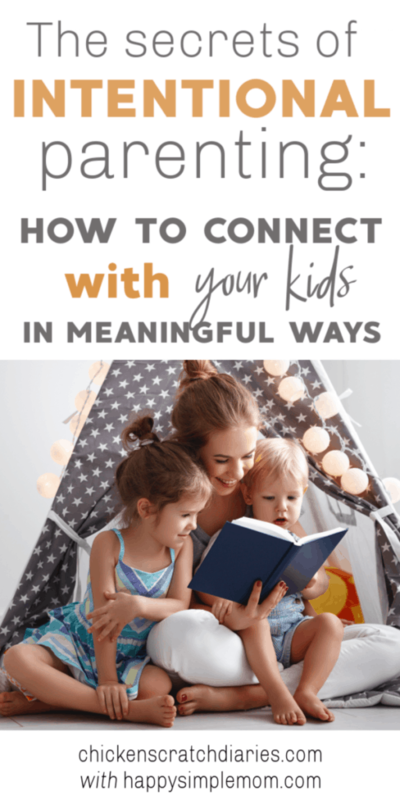 I want to make time to connect with my kids so they can learn how to connect with other people. I don’t want them to sit in a circle of their friends as teenagers, all staring at the phones and forgetting how to interact with one another. The only way they are going to learn these skills and other skills I want to teach them is if I make the time to actually teach them. Parenting is hard. In fact, it is no joke some days. Yet, every time we have a moment to connect with our children, it can fill our souls up just as much as it fills theirs. Intentional parenting is my way of being the best possible parent so my kids are best prepared for the lives ahead of them. What do your kids want from you? When is the last time you asked your kids what they wanted from you? I know, you are the parent, but hear me out. If your goal is to make more time to connect with your kids, ask them! So, I asked my kids. If you could choose what we do for an entire day, what would that be? They are five and six years old. I told them we would alternate days, and there were no limits to what they could ask. We could go anywhere and do anything (within financial reason). You know what my kids chose? For mama to play with them. They wanted me to jump on the trampoline with no rush to be elsewhere. I was asked to play house instead of watching them from the kitchen or while doing laundry. I was asked to stop being a grown up, even if for an hour or two, and give them the one thing they treasured most, my time. You see, to raise a happy kid, my kids didn’t need things or expensive experiences. They needed my time. 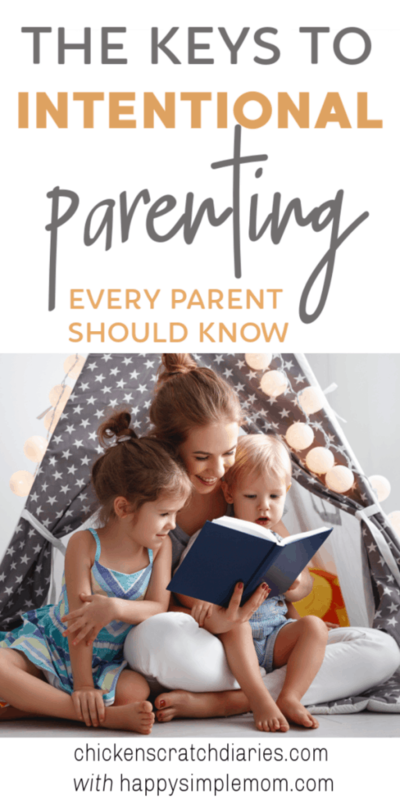 Intentional parenting is way easier than we think it is. I thought the extra time on my hands would naturally make me a more intentional parent. Guess what? It still took intention. However, it wasn’t as hard as I was making it. First, stop making such a big deal about it!! You are probably doing a better job than you are giving yourself credit for throughout the day. That’s the thing, we moms are too critical of ourselves. Think about your week. Think about those little moments of joy. What made them great? Was it cooking a meal and getting “help”? Was it making silly noises with a bathtub toy? Was it making up a story with your kiddo? I bet you have had more moments than you think. For me, intentional parenting means recognizing the moments and then replicating them…and taking the time to enjoy them. 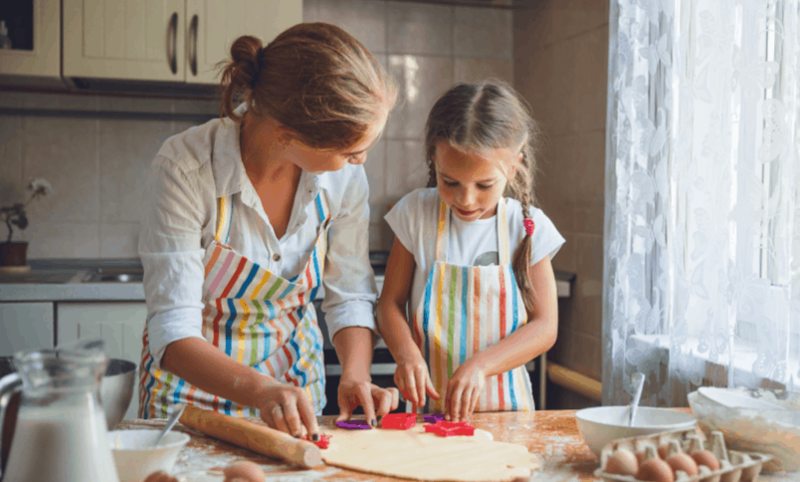 Again, intentional parenting doesn’t have to be a full-on Pinterest-perfect mom day. Remember when I told you my kids just wanted me to jump with them or play house? That’s pretty easy. And free. Need some ideas for simple intentional parenting moments? Read a classic chapter book. No matter the age of your kids, they may enjoy hearing your read out loud to them. Find a classic chapter book and read aloud for ten minutes every night before bed. Even though my oldest daughter likes to read chapter books on her own now, she still appreciates reading together and talking about books, especially chapter books they may be a little beyond her current reading level. Cook together. Children take absolute joy in learning skills adults usually execute. Go on a family walk around the neighborhood or a hike. Do a word search. Play tic tac toe. Have a game night. Better yet, make it a weekly family tradition. Dance for ten minutes in your living room. Forget your phone. Live a full day with your phone charging and not in your back pocket. It is so easy to nod, say “yeah, uh-huh” occasionally and not really listen to what your child is saying to you. I get it. We are busy mamas, and sometimes we just need to get stuff done. Yet, when you are in those joyful, simple moments, really focus and practice on connecting with your child. Put your phone away. Silence the TV. Close your laptop. Even if it’s only five minutes, practice listening to or connecting with your child. To them, those five minutes are just what they need. 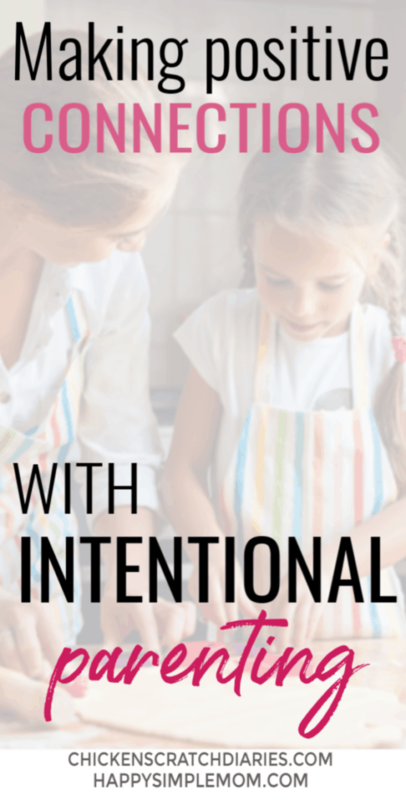 Intentional parenting isn’t hard, it just takes…well…intention. It may not come naturally to you at first, and that’s ok. Practice enjoying the little moments. You don’t have to be home all day. You don’t have to put all tasks aside until after bedtime. You can still be the parent that gets things done. Just remember when you have those moments to enjoy them. Focus on your child. Turn all your attention to them, for that small moment. That’s all. 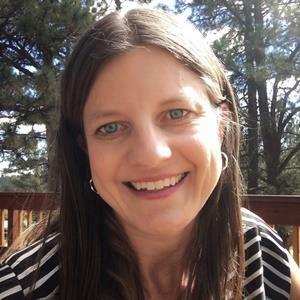 My name is Brooke, and I blog at Happy Simple Mom. I have been on a personal journey over the past few years to declutter my home, simplify my life, and make this whole mom gig a little easier. It is my mission to help other moms declutter their homes and lives and finally start experiencing being a mom without the chaos of emotional and physical clutter! If you are interested in decluttering your home and want a quick start guide, check out my FREE Declutter Your Home Starter Kit. It includes worksheets and checklists to help you get started on your decluttering journey. I would love it if you joined our community of moms who are ready to simplify and find joy, both at home and in life. You can also connect with Happy Simple Mom on Facebook and Pinterest. Great article! It’s so easy to get caught up in the everyday madness and forget that sometimes, all they need is a small window of uninterrupted time with you. I took Facebook off my phone about a year ago and it’s made a huge difference because it helped me get over my phone addiction. So now, when I’m with my kids I leave my phone on the other side of the room. Once challenge I do have is when they reach the age where they no longer “ask” to spend time with you. At that stage, it’s even more important to make the effort. That’s such a good reminder, Tammy, that we have to be consistent in cultivating our relationships with our little ones — because later on we’re going to need some creativity to make those same connections! Love the idea with the Facebook app too!